The top image is of the Release Promo (foil). The bottom image is the card found in booster packs of Worldwake. Both cards are playable in tournaments. You'll receive a Release Promo when attending a Worldwake Release Party at a participating store or location. 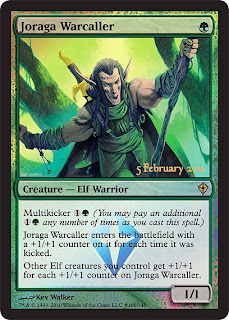 For 1GG, you get a 2/2, and all your other Elves get +1/+1. This effect stops when JW leaves the field. For 2GGG, you get a 3/3, and all your other Elves get +2/+2. And so forth. I think what's funny is that if you pay G, and then pump it with Oran-Rief, it's bonkers. You can also fetch this guy with Ranger of Eos! Sounds good! It's not bad with Ajani Goldmane either, although that would require a heavier white base.